From Tibet, and Myanmar with its range extending into the NW portions of Yunnan, the pendant, primrose yellow flowers of this rare beauty are richly colored in a royal purple. If seed can be obtained, it should be grown in a sheltered spot or a cool greenhouse. As with so many of the native lilies, drainage is a must. 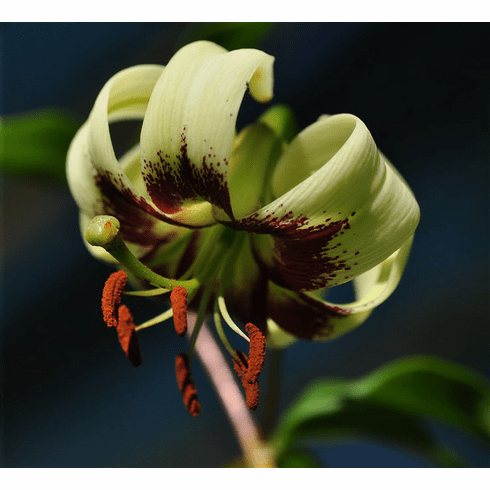 It is reported that de Graaff succeeded in crossing Lilium primulinum with some of his best trumpets, but there are no recorded introductions from those crosses. In China, L. primulinum is often referred to as being L. nepalense and the first plants that came from Burma collections were identified as L. nepalense. In nature, var. burmanicum has been reported growing to 8 feet (2.4 meters). Bulbs enjoy a deep compost / leaf-mold, loam with sand added for drainage. If attempted in the garden, a southern and sheltered exposure is a must for this lily. Title photo Photo copyright Pontus Wallsten, all rights reserved. Used with permission.